Walt Disney World Packages | Lowest Prices Guaranteed! To get the best deal on Disney vacations you will need to purchase a Disney World vacation package complete with lodging and Walt Disney World tickets together. Our customers who purchase Walt Disney World Packages save an average of 12% more than customers who buy each item A la carte. To find the absolute best Walt Disney World vacation package please use our custom package builder above. This is a really great tool to assist you in building your Orlando vacation package in just a few short minutes. Enter your dates of travel above and the number of adults and children in your party then push submit. The tool will show you the Orlando hotels and vacation home rentals we have available during your travel dates, after you have selected your lodging the tool will take walk you through choosing the Disney theme parks tickets which is best for your party. 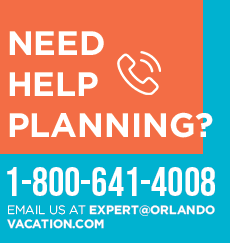 If at anytime you have questions, please feel free to call us toll free at 1-800-641-4008 and one of our friendly Disney World Vacation package agents will be more than happy to assist you. We have won the Best of The Best Award for online travel agency customer service for the past 5 years. We are proud to offer the easiest and best cancellation policy in Orlando. Click here to see our reservation policy. Theme Park tickets go up usually twice a year, but we will lock your ticket prices in at the price they are when you make your reservation. If the theme park tickets go up before the time that you are traveling we will contact you and give you an opportunity to purchase them at the original price. We only ask for a small $50 deposit to secure your reservation. If you compare this exact same package deal with Walt Disney World. We are 25% cheaper. If you compare this package deal to the one Walt Disney World. We are 37% cheaper for 2 Adults and 1 child. The Walt Disney World package prices above are quoted for traveling during the low season and staying in our Orlando hotels, the Baymont Hotel or the Holiday Inn Celebration. The package prices are based on 2 adults and 1 child and tax is not included. Get your FastPass- Once you know everything is set with your vacation we suggest you go ahead pay off your Disney World vacation package deal as soon as possible, and we will mail you your tickets. Why do you want the tickets early? Simple, you can go online and register your tickets and go ahead and make your FastPass reservations. Everyday you wait, more people who are registering before you. Get the Disney World Base Tickets- This one tip will save you $50 per person on your Disney World package price. A recent study showed that nearly 75% of the people who go to Disney World buy the Park Hopper Option, but 60% of the people never actually use it. Our suggestion is to order your theme park tickets without the Park Hopper Option. When you are here in town, if you find yourself really wanting to hop from park to park you can always go to the customer service desk at each Disney theme park and ask them to add the Park Hopper Option to your your tickets which they will gladly do.